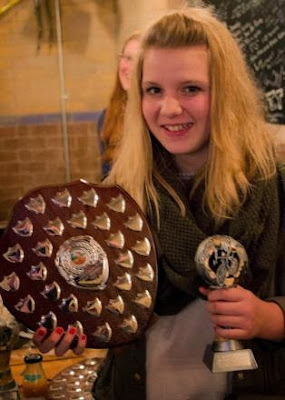 MORE than 90 Clifton Cycling Club members packed Your Bike Shed in Micklegate on Friday evening, 16th January 2015, for the club’s annual awards, which for the first time included Junior Go-ride awards. Recipients included British Cycling number one ladies junior Omnium champion Anna Docherty, aged 14, and men’s junior number two Rob Gray. Docherty took the trophy for youngest Reliability rider and, in recognition of her ranking, the club presented her with a skin-suit in Great Britain colours with Clifton club name down the side. Lauryn Dawber collected the Hilly T/T Cup for the club’s hill climb with a time of eight minutes and 26 seconds. Caven Walker received the Club Junior 10 mile Time trial award. He clocked 24.35. Other junior winners were Jess Smith, Leo Coning, Isobel Plummer, Jasper Wood, Ella Lazenby and Robin Smith. Bronze medals went to Ros Littlewood, Mark Briggs, Dave I’Anson, Graham Thresh, Bernard Turgoose and Ian Wilcox, while John Bricklebank, Steen Berg, Ian Hagyard, Darren Neylon, Rob Osman and David Whiter collected Gold in the Road Challenge series. Other awards were Dave Cook and Ian Hagyard - most meritorious ride 2014; York to Barcelona (Joe Calvert Shield); and Craig Brown won the most improved rider Chris Hillyard Cup. In the Mountain Bike section, Adam Bates received a gold medal, Andrew Windum a silver and Darren Neylon and Will Turley bronze. The Chris Wilson Memorial award went to Jeremy Wood. For services to the club, Andrew Johnston collected the Jack Wood Cup.